Pawn Shops Pay More Or Less? You are in need on some quick cash but don’t know how much a pawn shop will pay for your stuff? This is how you can get a good idea before you leave your home. Pawn shops are in the business to make money like any other business. In order to do that, they aim to pay as little as possible for some products in order to sell it for more in the future and they might not be able to sell it for a while so the value might decrease. Keep this golden rule in mind when trying to establish a value for your items. Whatever value you may come up with, you can expect a pawn shop to pay around 60% - 80%. Some pawn shops pay more than others, mostly in competitive areas where there are lots of shops in one area or city. In areas where there’s only 1 or 2, things are slightly different as there is no real competition. With all this being said, here are 2 quick ways with which you can determine how much a pawn shop might pay. It doesn’t matter in what country or city you are, precious metals are bought and sold based on their weight. Should you have a golden ring or necklace, you’ll get paid based on the weight and since most necklaces weigh more than rings, you’ll be paid more. 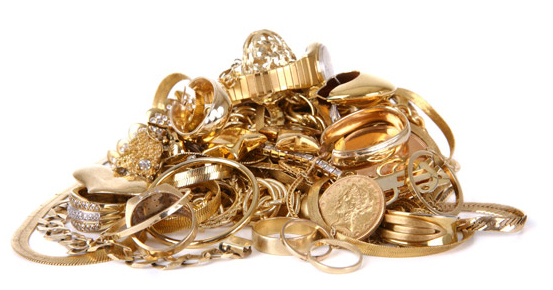 When it comes to your heavier jewellery, it’s best to get a loan out of it and then sell the gold that weighs less. How to Determine The Weight? Any jewellery that’s made from precious metals, are marked by a stamp with its purity. In other words, 10k, 14k, 18k, 925, 417, and 750 are some examples. This seems confusing but is actually really simple. Jewellery marked with 10K or 417 is 10 Karat. Jewellery marked with 14k or 585 is 14 karat, 18k or 750 is 18 karat and 925 is sterling silver, that won’t be worth as much as gold. As soon as you know the karat, you need to know how much it weighs. For this you will need a very small scale, usually those who are used in a jewellery store or pawn shop. Just take note to exclude the weight of the stones in the ring. That can’t be included in the gold ring and won’t be by the pawn broker. So whatever weight you get, make sure to subtract the weight of the stones. Now that you know the weight and the karat, go to a karat calculator online and put the amounts in there. Use this amount and work out about 60% - 80% of what you got. This is more or less what you can expect. Fill out our online enquiry form and we will contact you as soon as possible. If you have a picture of what you want to sell or pawn, attach it below for a even quicker response. If you accept our offer we will ask you to come to our secure facility for a physical inspection of your asset, and to complete the necessary paperwork. Once approved you get your cash instantly. When the loan amount has been paid back the asset is returned to you.